Create, Draw, Animate & Design! 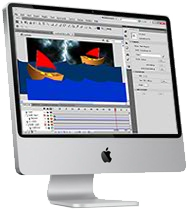 Animate CC | Level 1 teaches you how to create animation for web banners, presentations, eLearning, and interactive multimedia for web and desktop. Learn how to create your own graphics, import photoshop files, and add motion on the timeline. Learn Animate CC's drawing tools. Create shapes, add colors, make gradients, transform objects. Learn how to animate art with Motion Tweens, KeyFrames, on the Timeline. Create Masks to hide, reveal, parts of your animation and create effects. Explore Movie Clip, Button, and Graphic Symbols for efficient animation and organization. Animate with Motion Tweens, Shape Tweens, KeyFrames, and Motion Guides. Learn how easy it is to draw in Animate CC and then animate your art in a Animate CC! Create animated movies creating everything from scratch as you master Adobe Animate. Create art with Animate CC drawing tools, create symbols, add scenes, use gradients, masks, create animation using motion tweens, frame-by-frame animation, and lerarn how to use the Motion Editor to create animations, animate using color effects, transparency, filters, and easing. Create MovieClips using frame-by-frame animations and other symbols and art. You will create art from scratch and then animate it! Using motion guides to create a path for your animation, , create lightning in Photoshop and import it into Animate CC and see how these programs can work seemlessly! You'll add images, sound, video, and use color effects, masking and filters for dynamic animation... all this and more in this fun 3 day class! Animate CC: Level 1 is for students who are new to Animate CC (or who have used Animate only to build applications) that want to use it to build rich media applications that effectively use animation, sound, text, graphics, and video. and Onsite Animate CC Training nationwide.